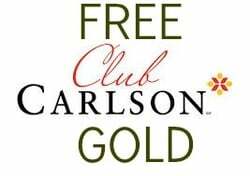 I became quite a big fan of the Club Carlson hotel chain. I posted in an earlier article about the great deal they have on 2for1 and 4for2 which was available only to Elite members. You can read my article here.Now the best part is that you can receive FREE Gold membership until February 2015 as well! This is pretty awesome and I am very excited. The reason this is an awesome deal is because you can use the offer on 2for1 and 4for2 which is a really a big saving. I used it in Heathrow successfully and I also received my points and qualifying nights! This means can still can re-qualify and keep my status if I complete the nights needed. I will be using this offer again in Heathrow, Dubai and Turkey In sha Allah. It does make a considerable saving and they have some really nice properties in South East Asia as well. Worth checking them out I think ;). The link to sign up is HERE and you have until the end of May to do so. I would totally recommend you sign up as soon as possible before they retract the offer. I tired it on my husband’s account and he has now successfully become Gold Elite too. Another beautiful thing about this Elite offer is that is it flexible and you can cancel at any time without penalty. Keep the tips coming in! !